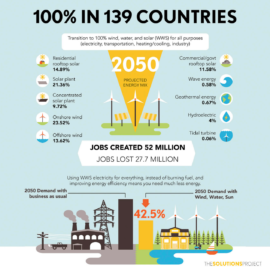 Mark Z. Jacobson, the famed professor at the Stanford School of Earth, Energy, and Environmental Sciences, and 26 of his colleagues have compiled a report that shows exactly how 139 nations could transition to 100% renewable energy by 2050 without throwing millions of people out of work. In fact, they contend that the changeover would actually spur job growth while dramatically reducing carbon emissions. The new report is an outgrowth of a similar project from 2015 that laid out the steps all 50 states in the US would need to take in order to transition to 100% renewable energy. Why 139 countries? Because that group is responsible for 99% of all global carbon emissions. The report was published August 23 by Joule, an online resource that focuses on news about renewable energy. Changing conventional wisdom is hard, but it can be done. People laughed at the Wright Brothers and their silly idea that we could fly from place to place. Today, there are more than 100,000 commercial airline flights a day worldwide. Television? Forget it. Smartphones with more computing power than an Apollo mission? Will never happen. Change happens very slowly, but when it gets started, it builds momentum with amazing speed. Jacobson’s group developed roadmaps that assess the renewable energy resources available to each country; the number of wind, water, and solar energy generators needed to get to 80% renewable energy by 2030 and 100% by 2050; how much land and how many rooftops these power sources would require; and how the proposals for each country would reduce energy demand and cost when compared to a business-as-usual scenario. The researchers examined several aspects of each country’s economy, including its electricity, transportation, heating/cooling, industrial, and agriculture/forestry/fishing sectors. Their analysis revealed that those countries with lots of available land will find the transition to renewable energy the easiest. Countries like Singapore, which has little open land and is surrounded by oceans, may need to look to offshore wind energy to meet its goals. 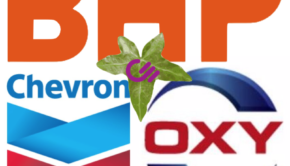 Moving away from fossil fuels will bring with it ancillary benefits. For example, eliminating the use of oil, gas will cut about 13% from the world’s energy budget because mining, transporting, and refining those fuels are all energy-intensive activities. The greater efficiency of electric motors versus internal combustion engines could reduce global energy demand by another 23%. Some benefits are hard to quantify, but less international squabbling over access to fossil fuels will definitely be a plus for all concerned. 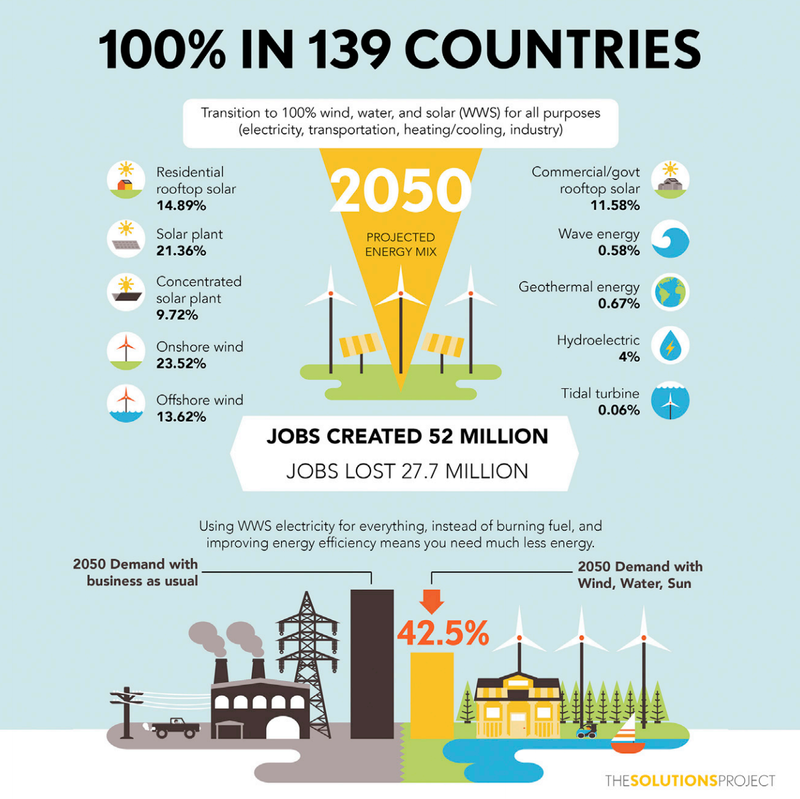 The authors also suggest that making the transition from fossils fuels to renewables will result in a net gain of 24 million employment opportunities worldwide. Critics of the report point out that the recommendations ignore the potential of nuclear power, as well as so-called clean coal and biofuels. The authors respond that nuclear plants take 15 to 20 years to design and build and bring with them “robust evidence” of a risk of weapons proliferation risk, meltdown risk, and waste management risks, according to the Intergovernmental Panel on Climate Change. Clean coal has been condemned recently as a myth, and the production of biofuels creates 50 times as much carbon pollution as renewables, according to the report. Jacobson and his colleagues highlight the inherent efficiency advantage of electric motors compared to internal combustion engines as the foundation of their recommendations. By their calculations, ICEs are less then 7% efficient by the time the costs of finding and extracting fossil fuels, transporting them, distributing them, and burning them are totaled and compared to the total amount of work produced. They go on to advocate for underground heat storage for homes and businesses, pointing to Denmark, where such technology is common. They also presume that electric airplanes will become commonplace in the future as more and more companies invest in that technology. So how much is all this going to cost? Trillions. But Jacobson and his colleagues say keeping the existing fossil-based economy will cost 4 times as much, particularly when the economic value of better health and longer lifetimes is factored in. Over time, those benefits will more than equal the initial investment needed to go 100% renewable. In the final analysis, how do you put a price on preserving a world that is fit for human habitation? In other words, an actual plan as opposed to political rhetoric or dogma. Combined with the suggestions made by the authors of the new book Drawdown, the Jacobson report marks the end of hand wringing and the beginning of actual strategies to address the most serious existential threat humanity has faced since The Flood.